Not one gram of kitchen waste in your home will not go out of your home. No person will have to put their hand in your waste. Burden of our on society and public systems will reduce. No more dumping of our waste in peripheral dumping grounds. A 200-liter air that can consume 2 kilograms of waste produces 2 to 3 cylinders worth of fuel per year. We get the power to produce our own energy. This is a bold step to reduce the fossil fuel dependence. 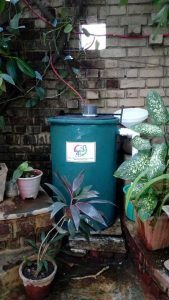 The slurry that comes out of the machine can be used as a organic food for the garden. It can be used to reduce the dependence and cost of fertilizers. Till now, we have installed 70 machines in Pune, Sangli, Aurangabad, Umarkhed (District Yavatmal), Palghar, Nashik and Hyderabad. Please contact us if you would like to see these working devices! We can decide the time based on mutual convenience. Request: If we care unable to receive your call due to some reason then please whatsapp / sms your name, contact number and convenient time contact. We’ll be call back accordingly. We have done two short films on Vaayu. Please see them on the links below. Vishwadeep Press Parts Pvt. Ltd.
We invite nature lovers to experience the magic of ‘Vaayu’. कचरा सुंदर आहे! औरंगाबादकरांना निमंत्रण! I am interested to install Vaayu-Mitra at my home. can you pl. send the details & cost… My address: Ramchandra Nivas, Plot no. 1 Kanjur society, Bhandup (East), Mumbai Pin 400042.